Having taken part in the last three COPs (Conference of the Parties or United Nations Climate Change Conference), we now begin to realize the full extent of what is going on, the causes and potential solution pathways opening up before our eyes. Solutions to climate change framed as opportunities to transform our entire economic system. An unprecedented change of course that is necessary, possible and even certain, as the great Jose Luis Sampedro -a Spanish humanist- used to say. We can take advantage of the civilization-wide menace of climate change to also put an end to the brutal inequalities, and erosion of human rights happening as we speak. It is time to forge a new social pact and move decisively towards equity, sustainability, real democracy and, let’s put it bluntly, real well-being and happiness. 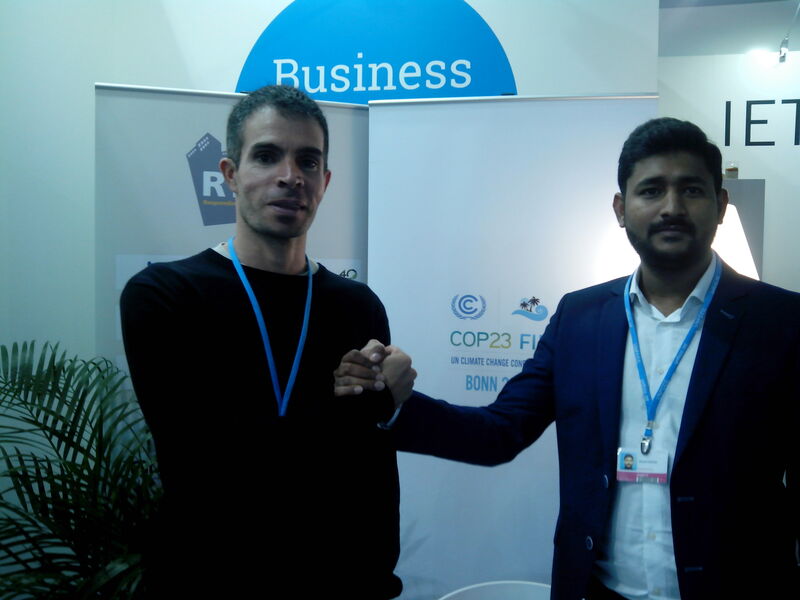 Jesus Iglesias from ECO4CLIM and Sumit Kishore -ECO4CLIM17 global climate champion- at COP23 Business Hub. In Paris (COP21) the historic framework agreement was reached. In Marrakech (COP22), the parties proclaimed their willingness to cooperate to put it into practice. 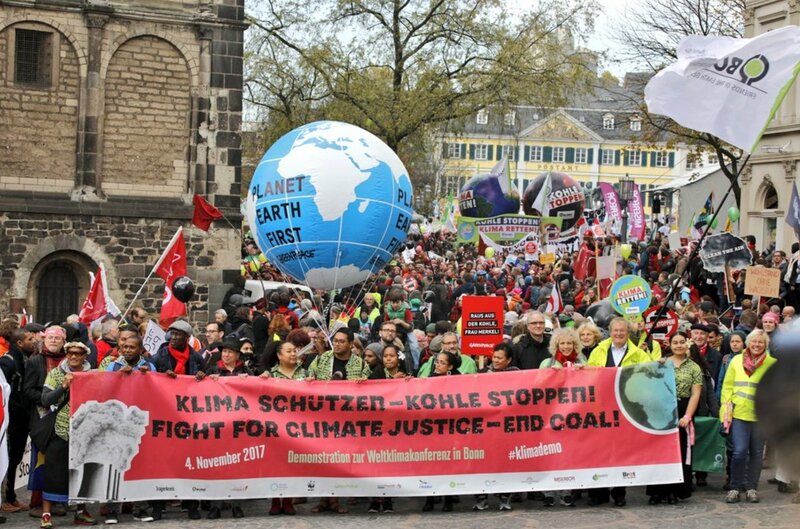 And in Bonn (COP23) … in Bonn a lot of things have occurred: from the urgency imposed by the already-catastrophic impacts of climate change; going through the new frontal crash against the underlying problem; and concluding with the hope brought by a diverse and joyful Climate Movement, evolving in the face of adversity. 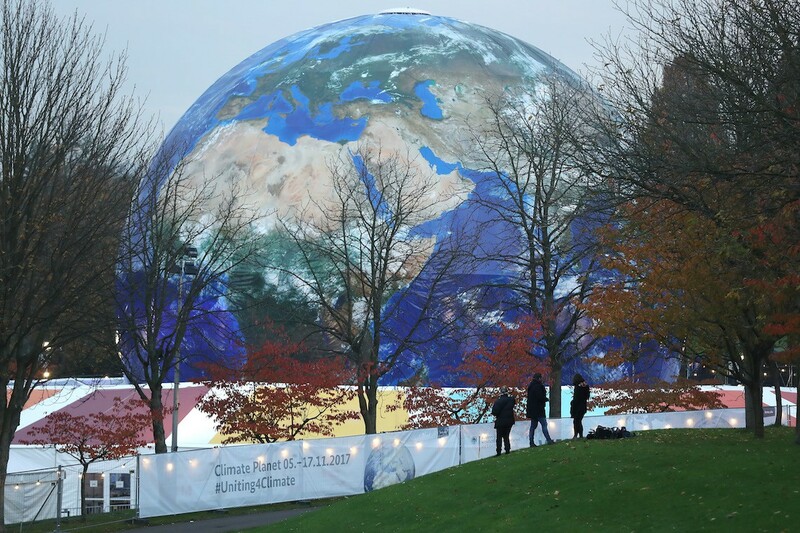 Bonn’s Climate Summit has had a strong symbolic character. 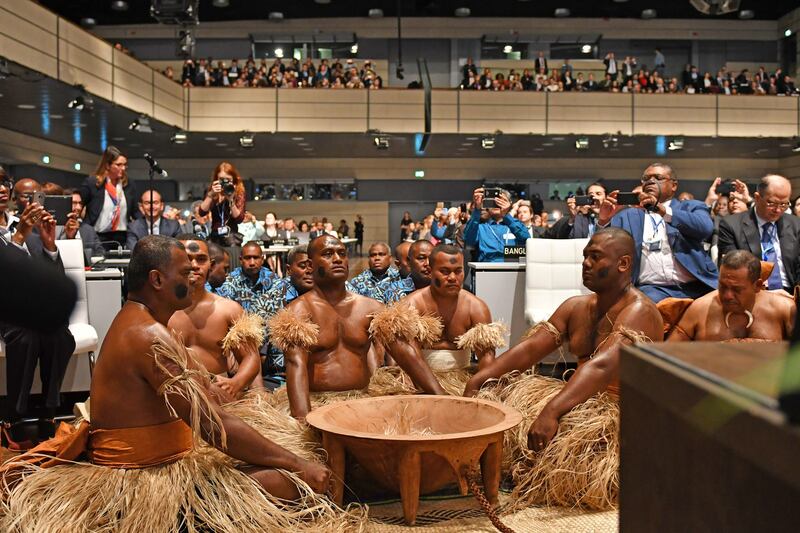 While the organizing country was Fiji, the meeting was held in Germany, given the lack of capacity of the former, decimated even more by the dramatic consequences of climate change (and other artificial oceanic disasters) this small and vulnerable insular state is undergoing. 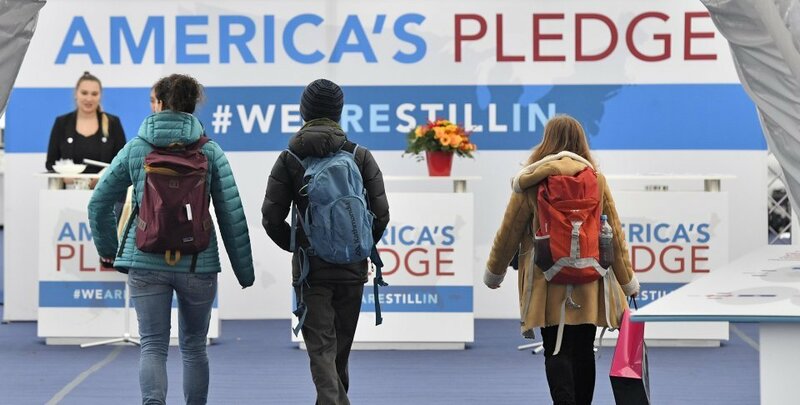 It is ironic that a highly industrialized country like Germany, among the main historical emitters of greenhouse gases, has to act as host for one of the nations that contributed the least but is affected the most. Are we talking about the first climate refugee country? We are talking about climate injustice and survival; but also about looking at the future with different eyes, and a true cooperative spirit between peoples, in pursuit of the common good. The summit began and alarms went off. All alarms. For only the second time in history, a global group of scientists (15,000 from 184 countries) issued a clear warning to humanity: our future as a species is in serious danger given the continuous degradation of the biosphere caused by unsustainable and hectic human development. On the other hand, several recently-published studies present a heartbreaking state of the global economic gap: 8 people possess the same wealth as half of the world’s population (3.6 billion). Easy to say, but a lot harder to fully grasp the implications, causes and interconnections with other challenges, such as climate change. For starters, as George Monbiot brilliantly puts it, “the richer we are, the bigger our footprint, regardless of our good intentions”; a statement backed by Oxfam’s research suggesting that the carbon pollution produced by the world’s richest 1% is around 175 times larger that of the poorest 10%. Yet, on top of the terrible environmental havoc, suffering, and effective loss of human rights caused; inequality entails other more indirect, but equally devastating, drifts. A comprehensive study carried out by the universities of Princeton and Northwestern shows the flagrant correlation between the wealth concentration and the implosion of democracy. Along the same lines, the “Paradise Papers” (or the Panama ones) reveal the tip of the iceberg of tax evasions, which together with other forms of corruption and wrong political priorities, lead to the erosion of the so-called welfare state. Needless to say that this Molotov cocktail eventually ends up igniting the flame of social tension, with the resulting resurgence of fallacious and dangerous “solutions” like nationalism, racism, or xenophobia. In short, we are losing the battle. In terms of inequality, protection of “Gaia” -the living planet-, democracy, and human values. We are losing everything. So let’s recognize it first, and then reflect deeply on its causes, questioning in the process our entire civilizational model, ways of life, and even global population growth. On to the causes now. Of course, in a complex world like ours, everything responds to a convolution of factors. However, by peeling enough layers of the onion, we can arrive at one common cause of almost all effects (the underlying problem): a globalized, deregulated economy, perpretrated by the infinite growth mantra, and fueled by consumerism. A couple of weeks ago, at at a climate change conference in Malaga (southern Spain), I heard, to my despair, a prominent speaker say the same thing world leaders say and do upon their return from the UN Climate Summit every year: “We can tackle climate change while we continue to achieve economic growth.” We can grow (by boosting the consumption of material goods and therefore the extraction of natural resources), so long as we decouple growth from carbon emissions. In widespread terms, the aim should be transitioning towards a “low carbon economy”, but one still fixated on growth after all. No, gentlemen, this is a fallacy, an apocalyptic error. This is ”The Problem”. Firstly, because the economy must be framed within the biophysical limits of our finite planet (obviously!) Secondly, because growth as the end (GDP for countries, economic profits for business, and possessions for people), forces us to consider everything else (workers, ecosystems) as means; thus irremediably leading to inequality, destruction and desolation. Thirdly, because sustainability has to do with the time dimension (future generations), but also the spatial one; and senseless growth in this regard only deviates us from the “human scale” where happiness lies: concentrated markets where big brands dominate and small businesses (SMEs) drown, even though the latter create most of the employment (67% worldwide) and social fabric, especially in vulnerable communities (up to 80%); powerful CEOs and national governments make decisions that affect remote people and places they don’t know. And fourth and worst, because past certain point (left behind by “developed” economies long ago), growth does not raise the Human Development Index of countries (much better indicator of “progress” than GDP), nor the happiness of its inhabitants logically. It’s not only me saying. It’s researchers, ecologists and authors like Bill Mckibben, Naomi Klein, or Juantxo López de Uralde in some of their publications like, respectively: “Deep Economy”, about a truly deep economy, rooted in reality; “Capitalism vs the Climate”, on the need to rethink the economic model to survive climate change; or “The Planet of the Stupid”, with recipes to get out of the “dump” created by a herd of “dumb humans”. Thinkers like Noam Chomsky in “Requiem for the American Dream: The 10 Principles of Concentration of Wealth & Power”, a pretty self-explanatory title. Economists like Robert Costanza or Herman Dali, founders of the Ecological Economics (can there be an economy without ecology?) Entire movements such as Degrowth or Transition Towns. 15,000 scientists from 184 countries. And even now the Prime Minister of a country: Jacinda Ardern of New Zealand, calling capitalistm a “blatant failure” that has ditched a good part of the world’s population. The verdict is obvious. It is time to abandon the dogma of growth, and its lever of consumerism, simply for a matter of survival, common sense and quality of life. But let’s not despair. There is a way out. We are the way out. The mood in Bonn wasn’t always negative, at all. 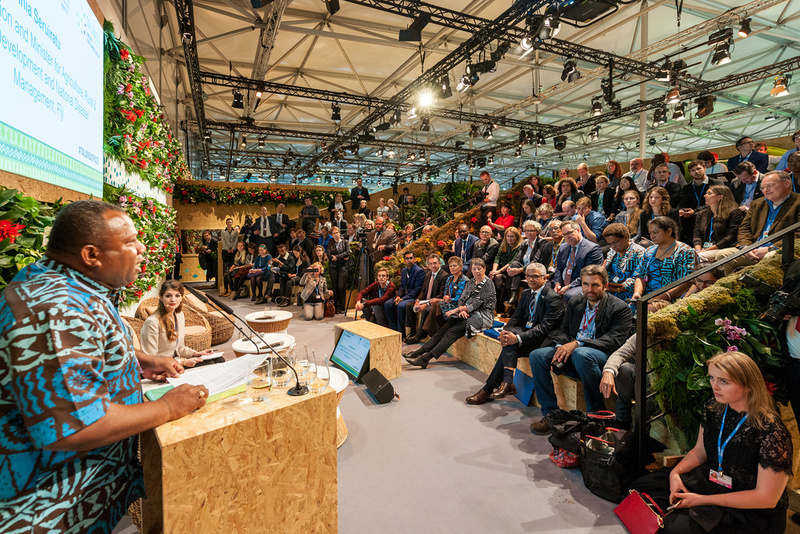 On the contrary, COP23 brought us the firm and shared leadership of the small Pacific island states, pushing for a limit to global warming of 1.5 degrees, instead of the 2 degrees that would probably imply their vanishing from the map. Thanks to them, the Intergovernmental Panel on Climate Change -IPCCC- is centering the special report “Global Warming 1.5°C” around this more ambitious scenario, set and aspired to by the Paris Agreement. The report will be released in October next year, and will include a series of proposals for action to achieve this life-and-death target. The “Bula Spirit” of urgency, affection, inclusiveness and transparency, infused by Fiji all throughout the summit, blossomed, for the first time in the process of POPs, into an open session of Talanoa Dialogue among state and non-state actors (civil society, cities and regions, companies …), forming a Grand Coalition to significantly raise climate ambition (# Uniting4Climate), both in Bonn and back in every corner of the planet. If globalization (and climate change, its unwated child) has made any positive contribution whatsoever, it is the development (after the first attempts of the 70s with the Apollo missions to the Moon, and the first environmental movements) of a global consciousness as a species, an understanding of our common destiny, as magnificently expressed in the documentary “In the Same Boat“. Because we are all in the same boat, led by the brave warriors of the Pacific. Personally, I was frankly fascinated by the physical and spiritual spaces dedicated to facilitating the dialogue among the participants, with some clear “Bula” vibes all over. And then solutions came to the rescue! Global networks of cities for the climate like C40 Cities, with Anne Hidalgo (Mayor of Paris) as a prominent figure, redoubled their efforts before the conference, through a variety of activities involving businesses (Together4Climate) and female leaders (Women4Climate); paving the way for humanity to move away from the losing battlefield of nation-states, and on to cities, municipalities, small economic agents, and collaborative networks. From negotiations hijacked by the narrow and short-term interests of the few; to the exchange and replication of successful models for the common good by the many. No example as illustrative as the US, with the different forms of resistance that emerged in response to the anti-democratic capitalism embodied by Trump the tyrant: Stand with Standing Rock (indigenous peoples and allies against oil companies), Women’s March (marches for the rights and equality of women), March for Science y Rogue NASA (NASA and the whole scientific community against the US governments’s anti-science crusade), Black Lives Matter and elite athletes kneeling in front of the flag (against racial violence and discrimination), Fight for 15 (workers for a fair minimum wage), the Sanctuary Cities and the Rebel States protecting immigrants against federal deportations and acting for the climate (including via high-level international diplomacy) … In Bonn, all these movements merged into one, materializing in the cry of anger and rebellion #WeAreStillIn, with which the American people, on behalf of many others, demonstrated their unwavering commitment to the Paris Agreement. Sometimes we -humans- need a common enemy/trigger to join forces and overcome formidable obstacles the likes of climate change and inequality, evolving as a society in the end. Every year I am part of this gathering of the global climate community, hope grows in me. I can’t help but think that so many people with so much talent and passion, on the right side of history, we can’t fail our children. And we won’t. Bonn was the turning point. We know the route now, let’s change the game board, go on the offensive, and build a new model that renders the current one obsolete. Here we are: The Revolution. It will continue. We will continue. Always. I am you, every person I've shared a breath of life with, every member of the Human Race. I am this Planet, its beauty and magic. I am the Stars in heaven. I am You. You are Me. We are One.